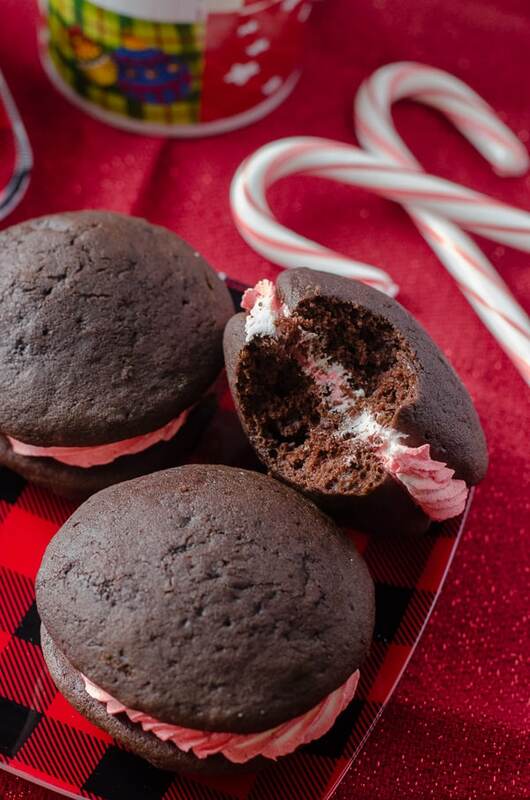 A cool & refreshing winter spin on a traditional Amish cookie, these puffy, cake-like treats are the perfect blend of chocolate and peppermint. Move over, my beloved pumpkin. Make way for Peppermint Mocha. And I don’t just mean in my coffee. The Sweetest Season Cookie Exchange Week 2015 is here, folks, and it means way more than just festive sugar, gingerbread, and more chocolate chip cookie recipe variations than you can shake a candy cane at. There is a HUGE giveaway hidden in this post! Like a prize worth almost $700 huge. But, let’s not get ahead of ourselves. 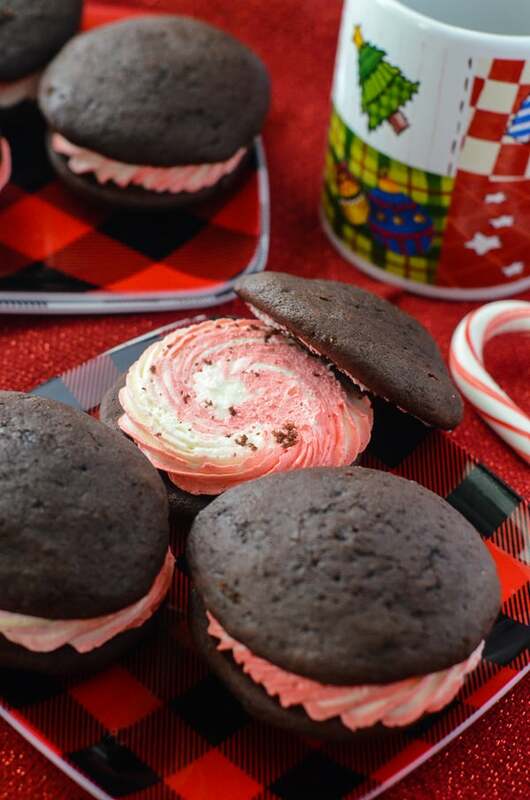 How about three cheers for these perfect Peppermint Swirl Whoopie Pies first? Being a Southern gal, I’m admittedly slightly ignorant of Northern traditions. In spite of my family all hailing from the Buffalo area (Go Bills! ), I’ve never actually had the chance to see where my grandparents and great-grandparents grew up. As for Mr. Crumby, he’s a Pennsylvanian – by way of the Dominican Republic – at heart, and he made sure to introduce me to the famous Amish Whoopie Pies during our last visit there a few years ago. Now, I’ve had types of whoopie pies before (mostly pre-packaged), but the first bite of the original was unlike no other. Soft, fluffy, dense, and sinful all at once. These are not your Amish Granny’s whoopies pies, though. These babies are made with no shortening (which is usually all or at least half of the fat used in these) – only my favorite beloved butter. 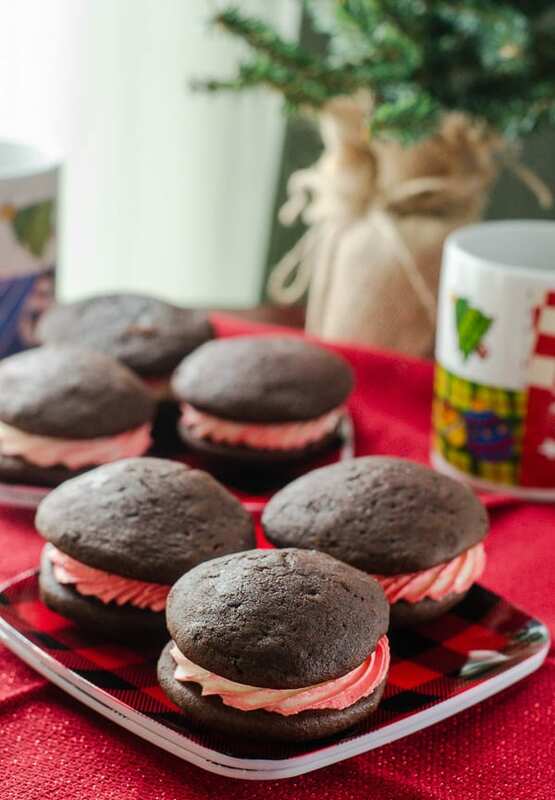 The chocolate cakey cookie is very similar to the tried and true version, and is pumped full of a peppermint and vanilla bean buttercream swirl that is just wonderful, and is bound to fill you with holiday cheer, especially if you’re enjoying them over a hot mug of coffee or cocoa. The Christmas season is my absolute favorite time of year for so many reasons, and not simple sentimental ones. I get to use ridiculous amounts of butter in all of my baked goods. Adding peppermint to pretty much anything is totally acceptable. 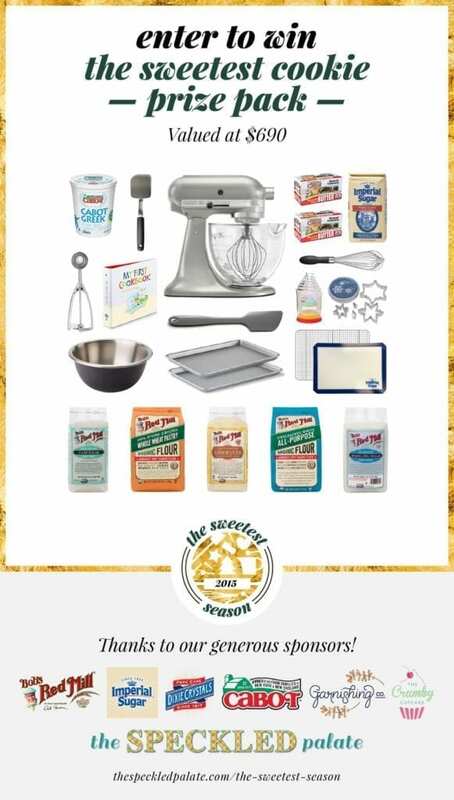 Oh, and I get to take part in one of the greatest baking giveaways ever! I’ll quit yammering. 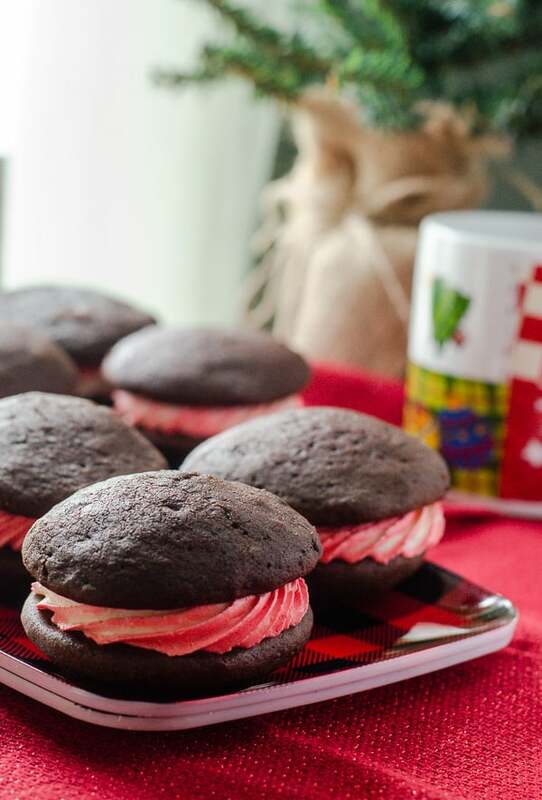 Make the whoopie pies, and enter this giveaway to help you do just that!! In a medium bowl, combine flour, cocoa, baking soda, baking powder, and salt. Set aside. In a large bowl, cream together butter and brown sugar for 2-3 minutes with a stand (or hand) mixer until light in color and fluffy. Add egg and vanilla, mixing until fully combined. Alternately add in flour mixture and milk (beginning and ending with flour), and mix until just combined. Using a small or medium cookie scoop, drop dollops of batter 2 inches apart on baking sheets (you will need to work in batches). Bake for 8-10 minutes until the cookies are puffy and spring back when gently touched. Remove from oven and allow to cool on baking sheets for 5 minutes before moving to cooling rack and continuing with the remaining batter. In a clean bowl, cream butter for 30 seconds on high speed. Add powdered sugar to butter 1/2 cup at a time, mixing on low and allowing it to combine before adding more. Add until it reaches your desired sweetness. Add in milk/cream a Tablespoon at a time, until the desired consistency is reached. Then add vanilla bean paste. Beat together on medium-high speed for 3-5 minutes until fluffy. Remove approximately half of the icing and place in a separate bowl. Add peppermint extract and desired amount of red food coloring to remaining icing and continue to beat 1 more minute until incorporated. Stripe a piping bag on one side with the red peppermint icing, and carefully stripe the other side with the vanilla. Flip half of the cookies so the flat sides face up, and fill them with icing, swirling from the outside to the inside. Top with remaining cookies, serve, and enjoy! 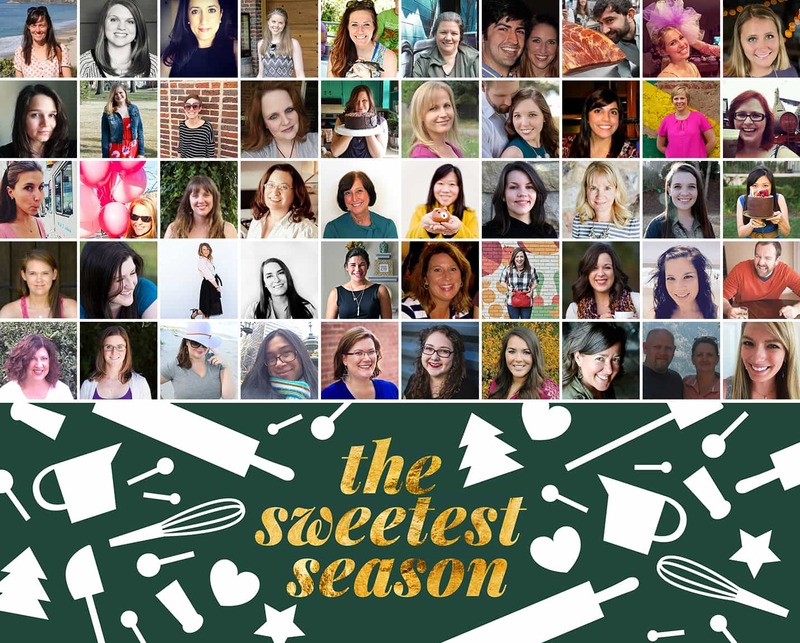 60+ blog friends are sharing gorgeous cookie recipes over eight crazy days, and today, I’ve teamed up with 50 other bloggers to bring you The Sweetest Season’s Sweetest Cookie Giveaway! Miss Erin at The Speckled Palate, Miss Susannah at Feast + West, and Little Old Moi have helped to put together an incredible cookie baking prize package, and I can’t wait to tell you more about it! Great giveaway – thank you so much for this fabulous opportunity!! FYI, there are numerous broken links in the rafflecopter, especially in the Instagram follows. They look great! I must try sometime! 1. 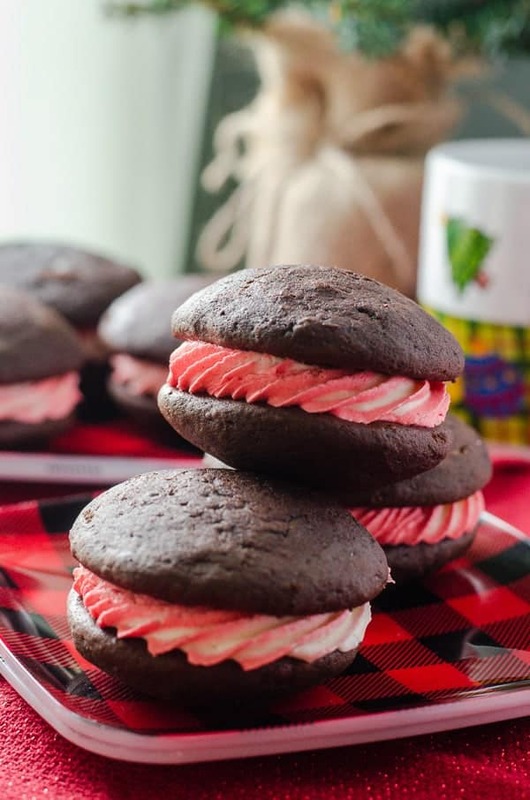 These whoopie pies look RIDICULOUS in the best possible way. 2. I’ve never had a whoopie pie at home, though I’ve had some Pennsylvania Amish ones that were badass. 3. I need to try these ASAP. 4. You are so lovely! Thank you so much for participating in this year’s cookie exchange and helping with the giveaway, too!